YAY! I am an ARTWORLD! Artworld is a blank slate for creating maps to be used as paintings. It is a creative world that shares inventory with the lab. It is made of a checkerboard of black and white squares that are the exact size of one map, 128x128. No measuring is required. Ordinary rules still apply for grief, you can and will be banned for destroying/defacing/editing other peoples' art without their permission. IMPORTANT: As the map becomes full, older builds may be removed at Cronie's discretion. Nothing in Artworld is guaranteed to be permanent so save your maps. Step 2. Find an unoccupied square and make an art. Do not build in the center square. Step 4. Open your inventory and mouse-over the map. 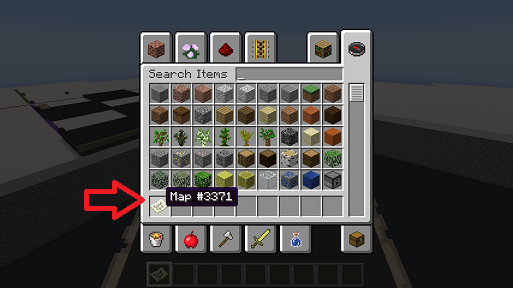 Look for the map number, as shown in the image. Write down the number for future reference. Step 6. You are done.